Heather fabric, also known as heathered fabric or mélange, has been growing in popularity over the last few years. Its unique look and comfortable feel has been popping up everywhere, from the boardroom to the gym. Heather fabric provides an extremely soft hand—a fashion term for feel—making it ideal for athleisure and lifestyle sportswear. But it’s also found in more upscale fashion. For example, mélange suits are sometimes taking the place of the classic charcoal gray suit. While it is popular in retail, heather fabric isn’t just trending in clothing. It’s found everywhere fabric is used, from bedding to bags. Here at 4imprint®, we’ve been expanding our collection of heather fabric promotional clothing and have added several Exclusive promotional bags for your fashion-conscious customers and employees. 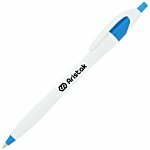 These fresh items will make the recipient—and your brand—look good. 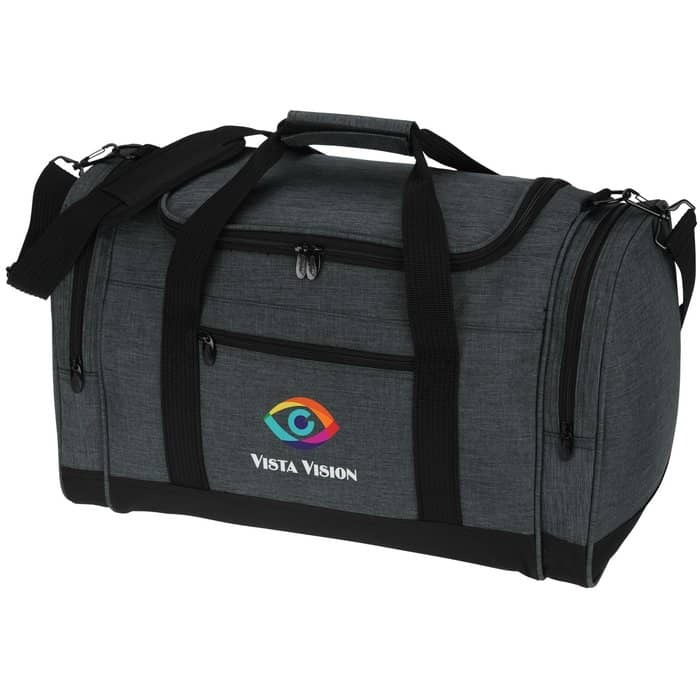 The 4imprint Heathered Leisure Duffel is available with a screened, embroidered or full-color imprint. 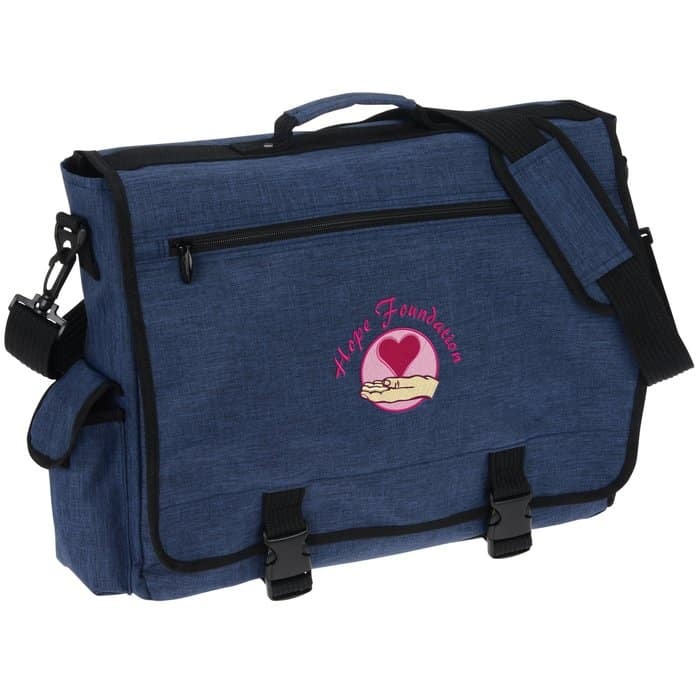 It comes in gray or navy heather and features grab handles and a removable shoulder strap for multiple carrying options. Various pockets provide ample storage, while the plastic feet save wear and tear on the bottom of the bag. Choose from an embroidered, full-color and screened imprint on the 4imprint Heathered Business Attaché. The exclusive business bag is available in classic heather gray or heather navy, offering a fashionable choice for the modern executive. It has pockets for a cell phone, water bottle and media player as well as a headphone port for ear buds. The Portland Laptop Backpack—also available with an embroidered imprint—offers a simple way to organize their laptop and office supplies. 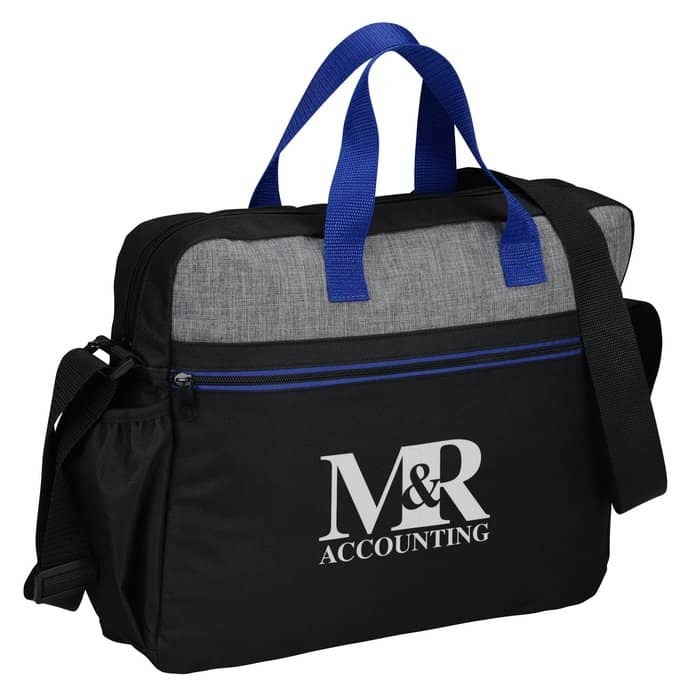 This black and gray heather bag has a variety of accent colors, so it’s easy to find the perfect match for your brand. There’s a padded interior sleeve for a laptop plus a front zippered pocket for smaller items. The buckle and drawcord closure on the main compartment keeps everything in place. The Portland Laptop Briefcase Bag—also available with an embroidered imprint—has a heather accent across the front. The bag has a large main compartment that can hold a 15-inch laptop plus a front zippered pocket perfect for smaller items like a wallet and phone. 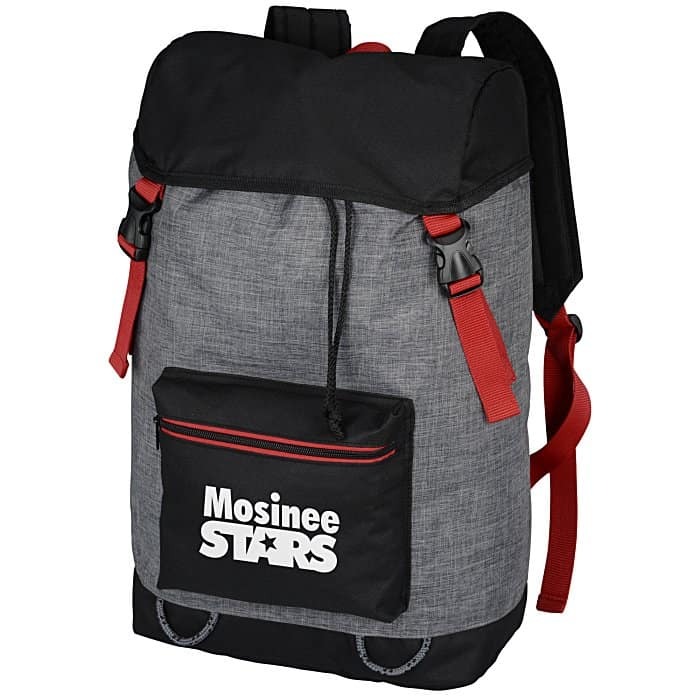 This bag also has a side pocket for a water bottle, eye-catching colored grab handles and an adjustable shoulder strap for easy carrying. Esquire® listed a gray heather T-Shirt among its list of 10 must-have T-Shirts for men. “A stalwart that looks great with jeans, chinos, or shorts—or worn under an unstructured navy blazer,” they said. 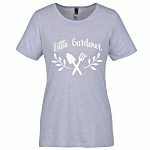 Gray is just one of eight color choices for the Fashion Heather T-Shirt. 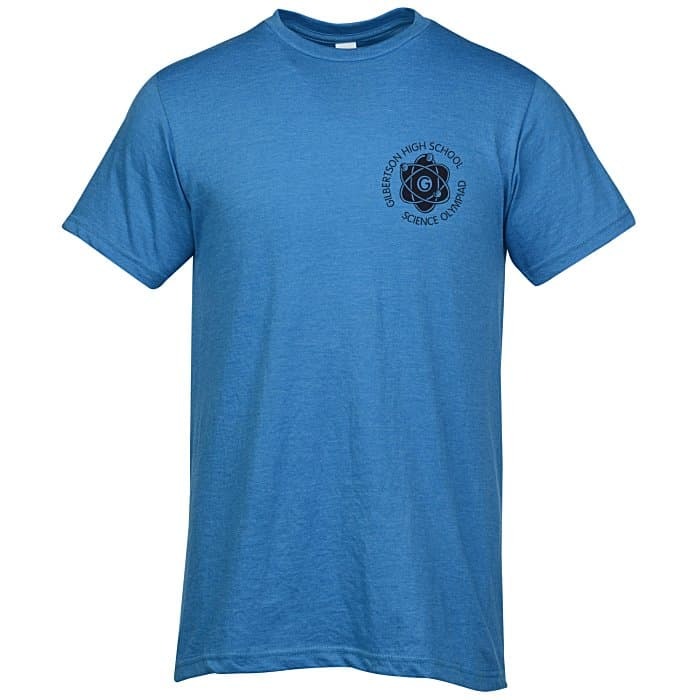 This basic crew T-Shirt is lightweight yet durable, with a self-fabric collar and double needle hem and sleeves. And don’t forget the ladies! Trendy heather color shirts are sure to become favorites. The Voltage Heather T-Shirt is available in 13 colors, ranging from the traditional red and navy to the electric power pink and lime shock. 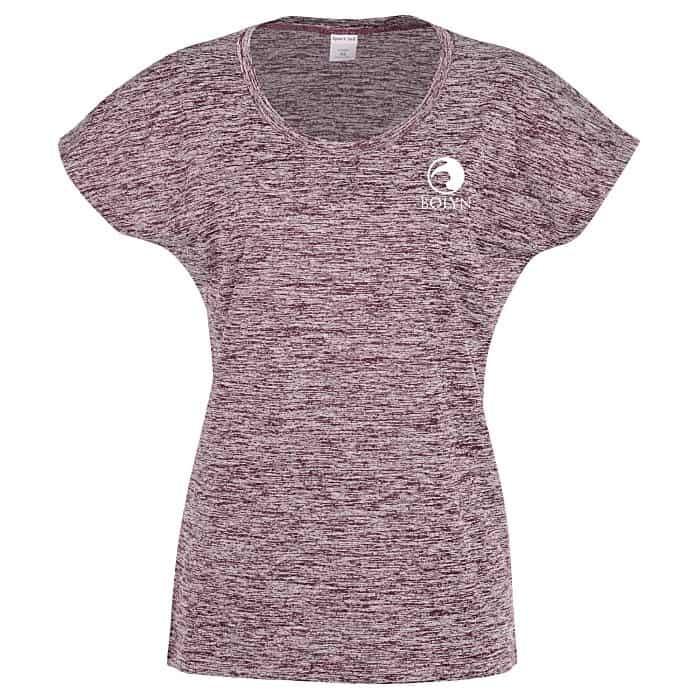 The shirt is finished with a scoop neck and an athletic fit. For promotional clothing and bags that are comfortable and fashionable, try heather fabric on for size. Our extensive collection of heather items make ideal gifts for employees and customers. 4imprint proudly presents our exclusive lines of custom logo’d backpacks. Find out more about these functional, yet fashionable, branded laptop backpacks. Custom embroidered apparel makes a brand stand out. See tips for making your personalized embroidery pop!